Much like your parents, we here at Thrillist humbly recommend that you get a job. Everything in life will be way easier with money, and it will give you something to talk about with people you meet at parties. And you'll seem way more interesting if that job pays enough that you can buy drinks for those fellow party-goers. With that in mind, we recommend that when you're looking for work, you look to one of these 15 cities, which have the most jobs paying over $100,000 right now. The new list comes from Ladders, which often puts out reports like this. It's not guaranteed that if you get a Greyhound ticket to these cities you'll instantly be making enough money to stop taking the Greyhound, but it won't hurt your chances. As you can see, there's a big difference between the number of opportunities to make the big bucks at the top and bottom of this list. 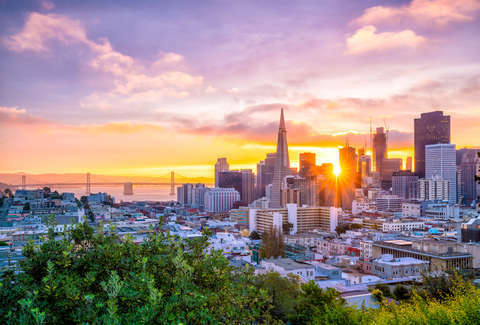 San Francisco, the number one city, has right around six times as many high-paying opportunities than the bottom spot, Baltimore. But you also won't be paying the highest rent in the country, so you'll have more of that $100,000 to spend on fun stuff if you do nab the job. And there will be fewer tech bros, which is a freedom you can't put a price on. If you do want to wade into those tech waters, there are plenty of opportunities, but Ladders also points out that jobs like Regional Sales Director are also available and paying a big wage in the area. It should come as no surprise that the only city really competing with San Francisco here is New York, where you will also be subject to an entirely different brand of self-importance and high rent. And both of these cities are delightful in their own way, but it probably wouldn't hurt to let your eyes wander from the top two here as there will be less competition and, even if you don't get the big gig, you'll probably still be able to make rent. And worst-case scenario, you can just get this dream job eating BBQ.